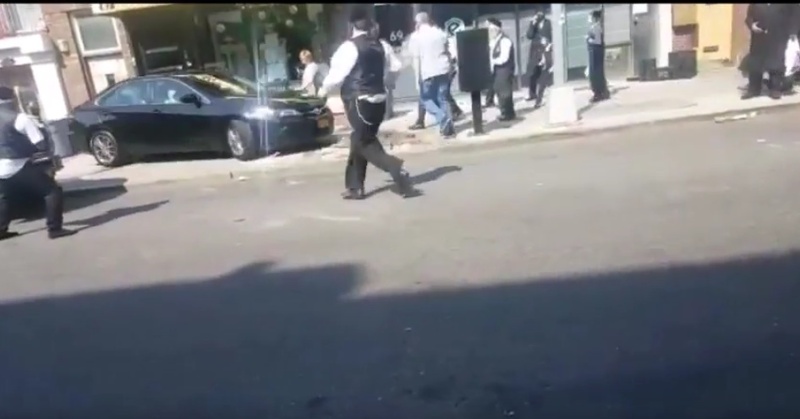 Brooklyn, NY - One man is in police custody this afternoon in connection with a bizarre turn of events in Williamsburg that sent a nine year old Chasidic boy to the hospital with non-life threatening injuries on Thursday afternoon after he was hit by a car driving on the sidewalk. Police said that the man in custody was the passenger in the Toyota Camry. Charges are still pending and the NYPD is continuing its search for the driver. As previously reported on VIN News(http://goo.gl/D1Tigt), two men who had been attempting to pass counterfeit bills in Williamsburg drove their vehicle onto the sidewalk in an attempt to flee the area before police arrived on scene. The incident took place at the southwest corner of Lee Avenue and Rodney Street and had pedestrians scattering madly as the black sedan barreled down the sidewalk on two separate occasions.